Five-in-one 16GBU power bank pen. 1..4 in 1 PEN POWER BANK= A USB FLASH+A BUSINESS BALLPOINT PEN +A POWER BANK+A TOUCHING SCREEN PEN. 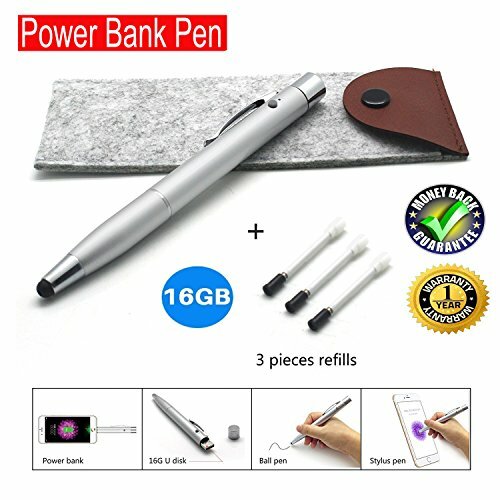 3.Power bank ballpoint pen stylus,lightning connector supports charger for iPad&iPhone/Andrews,NO NEED OF CHARGING CABLE. 4.As a U disk to save data from computer,take out the touch screen pen cap then plug USB port to computer,it can be as a U disk and charge pen together. 5.High sensitivity stylus is compatible with and will work with all capacitive touch screen surfaces, including smartphones, tablets, and touchscreen-enabled laptops. 6.Twist action ballpoint pen inside,write fluent (black ink).We have special cartridge can be replaced. 7.Plugs into any USB port (computer, wall charger, external battery pack, etc) to recharge battery inside the pen. 8.Emergency Power in your pocket. 650mAh Li-polymer battery inside. eg: can charging around 25% for iPhone . NOTE: When you receive product, it may power is insufficient, please promptly charge it before use. ❤High sensitivity stylus is compatible with and will work with all capacitive touch screen surfaces, including smartphones, tablets, and touchscreen-enabled laptops. ❤Lightning connector supports fast charger for iPad&iPhone/Andrews, no need of a charging cable.Can charging iPhone 5S to around 25%. ❤AS a U disk to save date from computer,take out the pen cap then plug USB port to computer,it can be as a U disk and charge pen together. ❤Touch screen pen :High sensitivity stylus is compatible with and will work with all capacitive touch screen surfaces, including smartphones, tablets, and touchscreen-enabled laptops. ❤The PEN POWER BANK=USB Flash+PEN + POWER BANK +TOUCHING SCREEN PEN, you just carry ONE PEN, and all needs are fulfilled. If you have any questions about this product by leyica, contact us by completing and submitting the form below. If you are looking for a specif part number, please include it with your message.